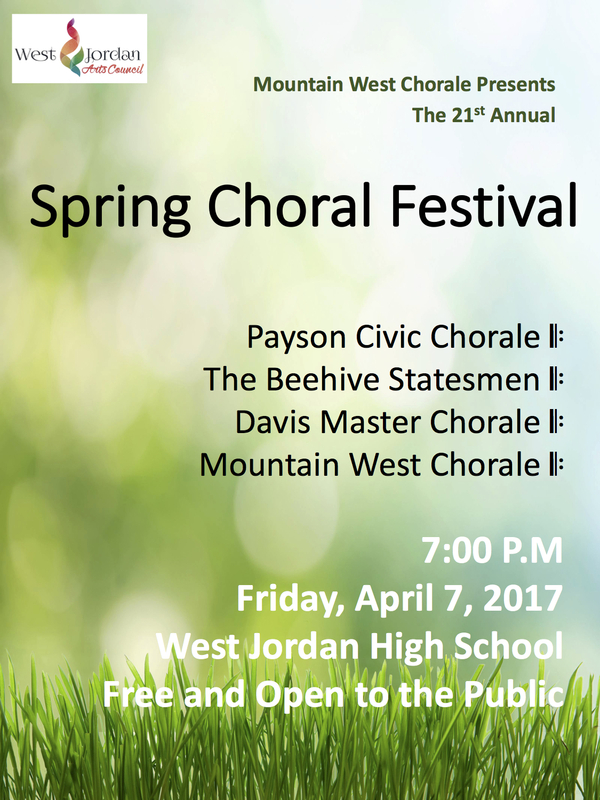 On April 7th, 2017, the Beehive Statesmen Barbershop Chorus, joined 3 other choruses for the 21st annual Spring Choral Festival held at West Jordan High School. This event brought together the Davis Master Chorale, the Mountain West Chorale, the Payson Civic Chorale, and the Beehive Statesmen for a delightful evening of both a Capella and accompanied singing. The Statesmen sang a small selection of their repertoire including; I Will Go Sailing No More, Hi Neighbor, Gospel Medley, Coney Island Baby, and What a Wonderful World. Beside providing ringing chords and close harmony, the Statesmen also provided some comic relief as they 'struggled' to deal with a inconveniently placed grand piano. The pinnacle of the evening was a performance of the Battle Hymn of the Republic performed jointly by all 4 choruses. This rousing finale, delivered by nearly 180 singers and directed by Richard B. Pearce, brought the audience to their feet and closed out the evening in delightful fashion. The Spring Choral Festival is supported by the West Jordan Arts Council and West Jordan High School.